Maqassa's Ghanaian striker John Antwi, an ex-Ahly frontman, was on target in stoppage time but it was too little, too late as the referee blew his final whistle immediately after kick-off. Although Ahly labored for much of the game, they will still be content to secure a morale-boosting win following their humiliation at the hands of South Africa's Mamelodi Sundowns in the first leg of the Champions League quarter-final last Saturday. Their win over Maqassa lifted them to the summit with 58 points, one ahead of main challengers and Cairo nemesis Zamalek who can restore their two-point cushion on top if they beat Masry on Thursday. Chances were few and far between in the first half, with the only real opportunity falling to Ahly's Nigerian forward Junior Ajayi who shot straight at the keeper when well-positioned to score. 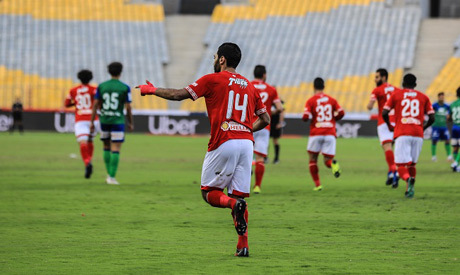 Defensive midfielder Fathi opened the scoring in the 25th minute with a simple free header after being picked out by an inviting cross from left-back Mahmoud Wahid, who made his first start after joining Ahly in January. In the second half, Maqassa wasted a clear-cut chance in the 72nd minute when Mido Gaber, who left Ahly in the January transfer window, ran onto a defence-splitting pass to beat the offside trap and go clear, only for keeper Mohamed El-Shennawi to rush out and thwart him. Azaro made the points safe with a simple header into an empty net after a shot from Amr El-Sulaya was parried by the keeper into his path. Antwi popped up unmarked at the far post to head home three minutes into stoppage time at the other end but it was not enough as Ahly moved top, at least for one day.